Home Surveys Who Should Be Pharma’s Social Media Voice? PR or Brand? According to Rich Meyer, who asked this question on World of DTC Marketing Blog (here), the answer is the latter. It’s natural that Meyer, who has a brand marketing interest and background, would favor one of his own for the job of communicating with consumers about brands. 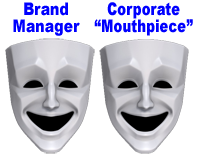 However, it can be argued that the distinction between pharma brand managers and corporate communications is a distinction without much of a difference these days, especially with regard to social media. There are many “PR” people using social media to communicate with patients about brands and disease information. Corporate communications people, some say, are be the right people for engaging patients via social media because they are trained communicators and are more socially engaged than product managers. Please take 2 minutes to answer this survey now. After completion of the survey, you will be able to view the de-identified summary of results (comments not included) to date. Results of this survey (including comments) may be summarized in an issue of Pharma Marketing News.